How many different gift cards does Giant Eagle currently carry? Even those of us not in the Big-Bird-Gift-Cards-for-Gas program have likely noticed the gift card gauntlet retailers are up against this year. The challenge: Personalize the ultimate impersonal gift. And, get the card-buying masses to wrap up yours. Category leaders like Starbucks have enabled full personalization and design of their cards online - to the delight of caffeine-addled art directors the world over. Borders, Circuit City and others are offering a simplified approach to personal design with a single photo upload. Home Depot's cards double as a CD of How-to tips for the DIYer on your list. And, the Big Boxes are going after the little box with entire catalogs of just-right-for-you card decor, from Barbie to the nearly-old-fashioned spotted dog. If the personalization isn't enough to woo you, there's always old-fashioned bribery. LL Bean will give you a free tote for giving a card, Circuit City will reward buyers with an instant-win card to try your luck at a big holiday surprise for yourself, and most of the restaurants are trading 'cash back' cards for gift card sales. But, all that said, there are two programs that I think are stand-outs this year. 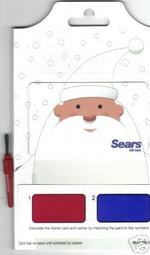 First up, the Sears card. I was already doting over the nostalgia of the Wish Book when I saw these two winning cards: A water-paint gift card that lets the giver or getter paint the scene (just don't drop it in the snow) and a sticker-book kit that lets buyers deck out their cards. Great extensions of the childlike fun of the season and the nostalgia of family holidays. Second, the Bob Evans gift card tin. 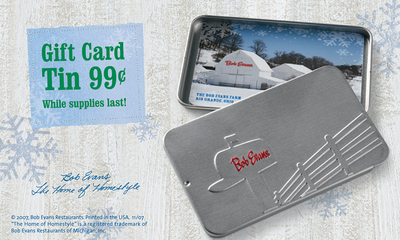 Your choice of several snowy Bob Evans cards fit neatly in this cute brand tin. Considering that 88% of us (according to NRF) will buy at least two gift cards this year, the tin seems like a great add-on for the gift-giver - a place to store all their plastic cash without stretching out their wallets or pockets with the temporary cards. Answer: Giant Eagle carries 275 different gift cards.